Subject to correction, the product was first added on 2019-01-14 16:14:19 and the last date we have for this product is 2019-01-14 16:14:19, where the last unit was sold for R 5225, which may have been a final clearance price. 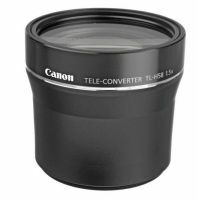 Canon TL-H58 Tele Converter Lens (1.5x), 58 mm Copyright © 2019 ComXpert International CC - COPYING IS ONLY ALLOWED FOR THE PURPOSE OF SENDING US ENQUIRIES. E&OE. The Canon TL-H58 Tele Converter Lens (1.5x) is specifically designed to extend the telephoto range of Canon's HF S10 and HF S100 high definition camcorders. Use this tele conversion lens to capture far off subjects with clarity and precision. Other HD camcorders with a front filter thread of 58mm also compatible with the TL-H58. Box Dimensions (LxWxH) 8.5 x 5.8 x 3.7"
The best price and guaranteed service and backup from official computer suppliers in South Africa for the 3573B001AA Canon TL-H58 Tele Converter Lens (1.5x). Find related 3573B001AA Canon TL-H58 Tele Converter Lens (1.5x) products in our Digital camera lenses Category for even more options. Read reviews and find out about 3573B001AA Canon TL-H58 Tele Converter Lens (1.5x). Discounts, specials and cheap prices only at ComX Computers.